As of Android Plugin for Gradle 3.2 Canary 15 the workarounds for Instant App builds described in this article are not required. The build now correctly uses code from all modules for the Proguard steps and then redistributes them back to the feature APKs. Converting an existing app project into an Android Instant App can be challenging, but it is also a great exercise in modularizing and structuring your project, updating SDKs, and complying with all of the Instant Apps sandbox restrictions that were put in place to keep Instant Apps secure and loading fast. One of the restrictions states that for every URL handled by your instant app, the total size of the required feature module and base module delivered to the client device must not exceed 4 Megabytes. Think about a typical common module that you might have in your project (in Instant Apps terminology we will call this module the base feature module): it probably depends on many parts of the support library, contains SDKs, image loading libraries, common networking code etc. That’s usually a lot of code for a start, and doesn’t leave much space for your actual feature module code and resources to fit in that 4 Megabyte limit. There are many general and AIA-specific techniques for reducing APK size and you should definitely go over them all, but there’s one thing that’s absolutely essential for Instant Apps — removing unused code with ProGuard, which helps slim down all those dependencies by dropping parts of imported libraries and your own code that you never actually use. ProGuard can be pretty challenging to configure even for regular projects, but when enabling it for an Instant App it will almost certainly fail your build or crash your app. The new com.android.feature Gradle plugin (used for building AIA modules) simply didn’t exist back when ProGuard was integrated in the Android build, and ProGuard doesn’t take into account how modules are loaded together at runtime. Fortunately, there is a step-by-step process you can follow that will make it easier to configure ProGuard for your Instant App, which I will outline in this article. 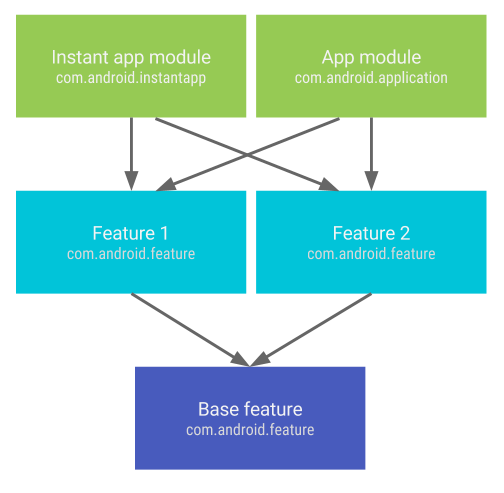 In a shared instant app / installable app project, feature modules replace the old com.android.library modules. When building an installable app, ProGuard runs at the end of the build process. Feature modules behave exactly like libraries — they contribute code and resources to the final stage of compilation, which happens in the app module, before packaging everything into an APK. In this scenario, ProGuard is able to analyze your entire code base to figure out which classes are used and which ones can be safely removed. In an Instant App build, each feature module produces its own APK. Because of that, as opposed to an installable app build, ProGuard runs for every feature module’s code independently. For example: the base feature compilation, code shrinking and packaging happens without looking at any code contained in Features 1 and 2. To put it simply: if your base feature contains common elements (such as AppCompat widgets) that are only used in Feature 1 and/or Feature 2 and not in the base feature itself, these elements will be removed by ProGuard, which in turn will result in a runtime crash. Now that we understand why ProGuard fails, it’s time to fix that by making sure we add the necessary keep rules to our project’s configuration to prevent classes that are used across different modules (defined in one module, used from another) from being removed or obfuscated. 1. Get your installable app build working with ProGuard enabled and fix any runtime errors. This is the most difficult part and the only one which is not easily repeatable, as the required ProGuard configuration rules will differ for each project. I recommend becoming familiar with the Android Studio documentation, the ProGuard manual and my previous article on dealing with ProGuard errors. We will need the rules from the installable app in our instant app ProGuard configuration later on. In the installable app build, ProGuard runs only once: in the module using the com.android.application plugin. In an instant app build, we need to add the ProGuard configuration to all feature modules, as they all produce APKs. In the snippet above I chose to use a file named aia-proguard-rules.pro for my Android Instant App specific ProGuard config. For the initial contents of that file you should copy and paste the rules from your installable app (from step 1 of this guide). We need to figure out which classes that are included in the base module are used from your feature APKs. You could track that down manually by inspecting the source, but for a large project that’s infeasible. There’s a trick to doing this almost automatically using tools available in the Android SDK. First, have a debug build (or just one without ProGuard enabled) of your instant app ready. Unpack the ZIP file (usually found in <instant-module-name>/build/outputs/apks/debug) so you have easy access to your feature and base APKs. The output shows us (P)ackages, (C)lasses and (M)ethods (P/C/M in column 1 above) that are (d)efined or just (r)eferenced (d/r in column 2 above) by this file. We’re almost done, but there’s one more detail we need to take care of. Sometimes it happens that you use a class from an Android resource, such as instantiating a widget from an XML layout file, but you never actually reference that class from code. In an installed app build, this is taken care of for you automatically by AAPT (part of the build which processes resources). It generates the required ProGuard rules for classes used in resources and in the Android Manifest, but in the case of an instant app build, they might end up in the wrong module. To fix that, first build your instant app with ProGuard enabled (such as using the release build that you just set up in previous steps). Then go into each module’s build folder, find the aapt_rules.txt file (look under a path similar to this: build/intermediates/proguard-rules/feature/release/aapt_rules.txt) and copy and paste its contents into your aia-proguard-rules.pro configuration. It occurred to me I made an important (and obvious now that I see it) omission in my guide. Because non-base modules are ProGuarded independently of each other, classes in those modules can easily get assigned the same name during obfuscation. For example, in module detail a class called com.sample.DetailActivity becomes com.sample.a, and in the module main the class com.sample.MainActivity also becomes com.sample.a. This could result in a ClassCastException or other weird behaviors at runtime, as only one of the resulting classes will be loaded and used. There are two ways of doing this. The more optimal is to reuse the ProGuard mapping file from a full, installable app build, but it’s tricky to set up and maintain. The easier one is to simply disable obfuscation in non-base features. As a result, your APK will get slightly bigger because of longer class and method names, but you still retain the benefit of code removal which is the most important part. If you got the initial ProGuard setup from step 1 right and followed steps 2–4 correctly, by now you should have a smaller, optimized instant app that doesn’t crash because of ProGuard issues. Remember to test it thoroughly by running the app and checking all possible scenarios, as some errors can only occur at runtime. Hopefully this guide gives you a better understanding of why ProGuard can be broken for your instant app. Following the steps should take you to a working build and stop your instant app from crashing. You can take a look at some of the instant app samples on GitHub which were recently updated with ProGuard configurations to compare your setup or even practice the method I described in this article on a sample project. I acknowledge that the solution above could be improved by setting keep rules per-method and not per-class (the command for listing referenced methods would be: apkanalyzer dex packages detail-debug.apk | grep "^M r" | cut -f4), which could lead to bigger size savings. It would make the rest of this tutorial (such as filtering out the framework classes) more complicated however, so I’m leaving it as an exercise for the reader.